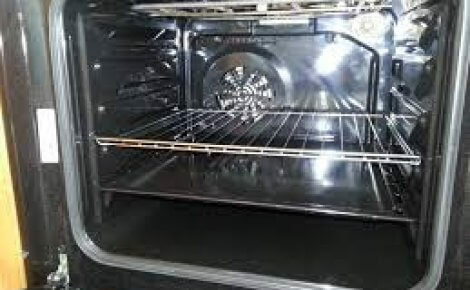 How to Clean the Oven :: My Cleaners London - Only professional cleaning! Know what type of oven you have. There are a few standard types of ovens, and they each require slightly different cleaning methods. Self-cleaning ovens have a feature that allows you to heat the oven to such a high temperature that the built up food and grease gets turned to ash. Textured ovens, or continuous cleaning ovens, have a porcelain layer that is designed to burn spilled food away while you are using your oven to bake. Regular ovens without these cleaning features must be cleaned regularly by hand. Prepare to clean the oven. Choose a time to clean the oven when your kitchen area is at its least active. Keep children and pets away from the kitchen while the oven is cleaning, since it heats to a very high temperature and tends to give off a burning smell. Open your windows to ventilate the kitchen, so your family won't be inhaling the fumes. Remove the oven racks. Place them in a sink full of warm water mixed with a few drops of dishwashing liquid to soak. Turn on the oven's self-cleaning mode. This should lock the oven door and heat the oven to between 800 and 900 degrees Fahrenheit (427 and 482 degrees Celsius). Make sure the oven door is locked before leaving the oven to clean. If the lock isn't working, put masking tape or some other kind of barrier on the oven door so your family knows it is not to be opened. The oven will clean itself for 2 to 6 hours, during which the grease and burnt food will turn into a light gray ash. Let the oven cool for at least 2 hours following the cleaning cycle. Open the oven door. Sweep out the ashes with a small brush and dustpan. Wipe the oven clean with a wet rag. Clean the oven door. Scrub the inside of the oven door with a clean rag and a misting of a kitchen cleaning product. You can also use a vinegar and water solution to do the job. Clean the oven racks. Scrub the oven racks in the soapy water. Rinse them off and dry them, then replace them in the oven.